A pair of separate volumes connected by a covered bridge form Atelier Pierre Thibault's latest project, a lakeside residence in rural Quebec. The long, elevated corridor gives the project its name: La Grande Passerelle. It was recently completed for a young family, and is set on a sloping site by Canada's Lac des Piles. The higher volume shelters the home from the street. It contains the garage on the upper floor, and an exercise room below. In addition to providing privacy to the rest of the residence, the annex volume delineates a light-filled courtyard. The lower portion of the house is larger, and contains the main living areas. Three bedrooms are located upstairs, and the public spaces are situated below. "The second volume comprising the rooms seems to float above the fully fenestrated ground floor," according to the Quebec City firm. The dining area, kitchen, and a double-height living room on the ground floor have direct access to a generous deck that surrounds the home. As the bedrooms are elevated, they also enjoy better views of the surrounding landscape. "The connection between the two wooden volumes is made by a large footbridge which penetrates the interior spaces of the house and projects itself towards the lake," said the architects, who envisioned the home as a well-defined sequence that culminates at the waterfront. "Visitors reach the residence by the upper floor to discover step by step the living room, the kitchen and finally the lower level that opens generously on the backyard and the dock." Light wooden boards clad the exterior of the buildings, creating a sense of continuity with the interiors, which feature wood floors and simple white walls. Minimalist furniture was chosen to accompany these finishes. In the living room, a double-height concrete chimney complements this aesthetic. 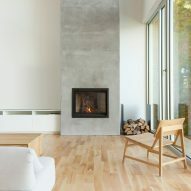 Atelier Pierre Thibault is well known for its minimalist retreats in the province of Quebec. Other examples of their work include a forest residence raised on stilts and geometric white house with a double-height living room.